This absence is a shame because, in fact, it’s something that we’re told to consider often. Paul instructs the believers in Colossae to “set your hearts on things above, where Christ is seated at the right hand of God” (Col. 3:1). The command is not a one-time thing because the word “set” or “seek” is in the present, active imperative indicating continuous action–basically he’s saying we should be doing this all the time. Paul wants us constantly considering the reality of Christ’s life at the right hand of the Father. Why? Because through our union with Christ, what is true of him has become true of us. 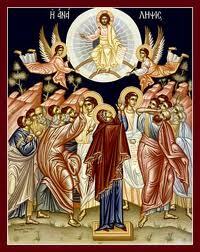 If Christ is risen and ascended, then we are risen and ascended with him. (Eph. 2:4-7) If we don’t understand this, we’ll miss out on some of the deep assurance that comes from the truth of the Gospel. Christ is now in heaven as our advocate, interceding for us, lifting up prayers, presenting himself as evidence, as it were, of his accomplished work on our behalf. There’s no need to doubt that our salvation is securely accomplished with Christ, seated after passing through heavens (Heb 4:14; 8:1). Also, since he is there and we are connected to him, we can be assured that one day we too will be seated with him, experiencing the fullness of God’s presence, ruling and reigning as God always intended us to be. He’s there “preparing a place” with the Father for us (John 14:3). Finally, Christ has not left us alone, but has given us his Spirit as an “earnest”, a down-payment of the glory to come. And not only that, but as the catechism points out, he himself is the one who helps us to keep our eyes set on the reality of Christ’s ascended life. Take some time this week to look up those verses; consider Christ, who is your life, risen and ascended (Col. 3:1-4). When you start to do that, all the petty things, the little things, the “earthly things” that Paul talks about, will start to take on their proper dimensions as your security in him is strengthened and your love for him grows. Praise the living and Ascended one, our life and our assurance. Lots to unpack here. Lots to encourage us. Thanks, Derek. So much to unpack!! The ascension is such a full doctrine. Thanks for stopping by, Charles! Yes, complete with his sanctified humanity, something savingly available to us (“unless you eat my flesh and drink my blood, there is no life in you”).